It's not 'Flying' it's Falling with style! Well Dave, Tim and I have been loosely talking about visiting the North of the Island for well over a year now, but up until last weekend we had struggled to find a time when everyone was available due mainly, to Tim and I working shifts and Dave only working lazy mornings. Due to Dave not having to do any work at all for most of the time, he has flown on that side of the Island before and indeed at almost every flyable site in the South. Anyway as I have already mentioned last weekend we did find time and Dave and Tim drove up to the border where they picked me up. Once watered and with all the kit packed we headed over the border and drove to St Hilarion and onward to Paradise launch. The wind was on the strong side but with long gentle lulls and we decided to wait a while to see what happened. While we waited Dave took it upon himself to brief Tim and I about the potential hazards and what to expect given the wind conditions. Thanks Dave! Due to Ozgur not being available to drive us Dave had said that Tim and I should fly first as he knew how to get to the landing area by road and that would be the easiest option however due to the strong nature of some of the gusts I elected to stay temporarily on the ground and let the experience lead the way. An instructor of mine always told me never to be the wind dummy! and this thought was very much shining through as being the most important to me. Dave of course accepted my offer to drive as I had mapped out the route from looking at the road from the hill. We decided that the gusts were getting weaker and the lulls were longer now than before though still a bit of a worry. Dave went first with a really nicely controlled launch followed by what I can shall describe as a bumpy departure from the hill. Tim was watching and thinking much the same as me which was "hmmmm! that looks uncomfortable!" but this we later discovered was only Dave faffing with his camera and other paraphernalia. Well as Dave climbed it appeared to to smooth out and Tim was happy that he could launch and fly and so launched into very nice calm air and played nicely around the front of launch with Dave. I wasted no time and jumped into the Red Rocket for the drive down and radioed to let the others know that I would be in the field for them when they landed. The drive down took me into radio shadow and so I was uncontactable for I guess 5 minutes. As I came around the hill and back into radio range I heard Dave brokenly and he said "Talk to me Tim!" I was still just out of range to talk to them and was around 8 minutes drive away. Dave then radioed that he was going to land and I answered that I would be there soon. I found the field without too much problem and walked over to where Dave was but I could not see Tim. I asked Dave on the radio if Tim was still in the air and he replied "Negative" an that Tim had landed quite expertly on a road some way up the hill. After helping Dave pack I radioed Tim and he answered that he was shaken but that he was OK and had had a bit of a heafty landing. I told him that we would be with him shortly. We found him on a very narrow track with tall trees either side, he was standing up and looking quite forlorn as we pulled along side him. We packed his kit into the Red rocket and went to have assess Tims last moments in the air. We'd been looking around for about 2 minutes when Dave announced that he had a nose bleed! well I just had to get a snap! Tim said he'd had a few issues fairly low and ended up having a collapse at the top of the trees about 12 - 15 feet I would estimate. I'm glad to say that after a few beers Tim seemed to be sore but fine! as you can see from the picture (left). We had a spot of lunch in a rip off Burger King called "Burger City", not my ideal choice of venue but given the circumstances it was fine! then we headed back to the top to have another look with the thought that I could have a fly. On arrival we noticed that the wind had dropped completely leaving me the choice of, fly top to bottom with no chance of playing or gaff it off as a bad job and go find another site. 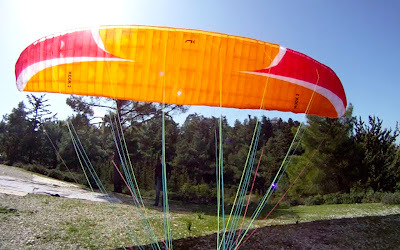 Well I was not going to pass up the chance to fly so I quickly set up and took the only breath of wind left on the hill to launch into a really pleaseant top to bottom. I had pleanty of time to look around and even over fly the area that Tim dobbed into and also to fly a short way along the new motorway and do a couple of 360's before I found myself at approach height. As ever I found that I had misjudged my height and needed to use alot more of the landing field than I would have liked but still had plenty of room if I'd needed it. I must work on this skill and try to judge a lower approach angle. See my track log here. Well after that the guys drove to pick me up from the bottom and we went shopping for the evenings supplies. 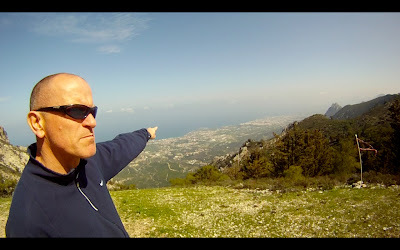 We drove from Kyrenia to Cantara castle where we found a convenient field out of the way and right on the coast in which to pitch our tent. The area was lovely with a nice clamber down to the sea and a spit of sand stone jutting out into a small bay 35°26'21.02"N 33°56'39.74"E.
We ate and drank well into the night under a very starry sky and at one point had to take cover as the local coast guard came along with search lights and were shining them at us quite alot. I think if we'd just have carried on as normal we'd have been fine but the alchohol made us all stand very still and even lie down on the rocks. Unfortunately the alchohol made me very loud and i couldn't stop talking even though we could hear the guys on the boat! oops! Well after a nice night we headed first to Kantara Castle to try to find the launch. The weather was pants and so we had a walk around the castle which was nice, on the way down the wind screen washers got blocked so I went to wipe the windscreen and Dave decided it would be a good laugh to drive off with me on the bonnet! Video to follow. Then it was off to Golden Sands to see if it was flyable there! Unfortunately the wind was well off to the East and when Dave gave it a go he went straight down for a play in the dunes. Once he'd finished we strolled back to the top and drove to the beech to have a look there. That was no good either though I did get a few pics. After that we drove home a really great weekend! Cheers Guys and Credit to both Dave and Tim as I have captured some of my photos off their videos. You'll have to follow Tim's blog if you want to know more about his mishap. Whether he shares his video I'll leave that up to him! On the way home we noticed a sign that we just couldn't work out! The Car wash name just makes no sence at all!